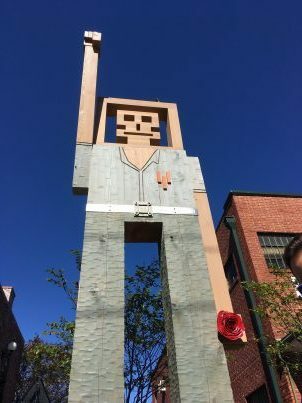 If you go to the Georgia Beer Garden for our monthly “Eat, Drink and Be Marxist” social this Friday – or any day – you will be greeted at the entrance by a monumental tribute to “Solidarity” – an 18-foot statue by that name, created by MADSA member James Wiggins, whose artistic moniker is “Evereman”. Art works with Evereman’s trademark square face have appeared on Atlanta’s streets for over a decade, freely shared with the public. The Beer Garden statue celebrates progressive values. In addition to the raised right fist symbolizing solidarity — the fist so much stronger than any single finger — the statue’s left hand holds a red rose. This international symbol of democratic socialism (as in DSA’s logo) hearkens back to striking immigrant women factory workers who marched on picket lines in Lawrence, MA in 1912 singing “Hearts starve as well as bodies; give us bread, but give us roses.” The statue also sports a fiery heart; a belt buckle inscribed with the West African symbol Mpatapo, meaning “peace after a time of strife”; and steel boots “for the throats of the oppressor,” according to Wiggins. The statue was unveiled Nov. 6, with remarks by MADSA officer Barbara Joye and Beer Garden owner and MADSA member Johnnie Martinez. © 2019 Metro Atlanta DSA.